The history of railroading in North America is as much a story of boardroom intrigue as it is a story of the brute force that stamped thousands of miles of train track across a rugged continent. Today’s nine U.S. and Canadian Class I railroads are the result of well over a century of convoluted bankruptcies, mergers, acquisitions, and expansions. 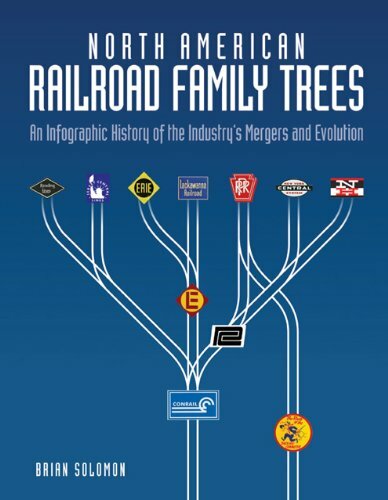 North American Railroad Family Trees marks the first time in book form that this major aspect of railroad history has been presented in a clear, graphic format, helping the railfan make sense of the many smaller train lines that shaped North American rail as it is today. In these pages, renowned rail author Brian Solomon takes a visual and chronological approach, presenting 50 “family trees” in the style of human lineages. The story begins with the railroads of the “Golden Age” (1890–1930), continuing through the second wave of consolidations between the World Wars, the merger mania of the 1950s through the 1970s, the creation of major passenger networks, and the megamergers of the last three decades that have left railroading close to its current incarnation. Solomon even offers a selection of maps tracing the evolution of the North American rail system and diagrams proposing what-if scenarios for the industry’s future. Including chapter-by-chapter narrative overviews of key eras, along with a selection of rare photography and period advertising to lend historical context, North American Railroad Family Trees provides an unprecedented retrospective of the continent’s iconic rail network.